"Funny you emailing this morning, our fencing has had quite a bit of neglect over the last 4 years and only yesterday I spent an hour going all the way around, replacing some broken insulators. It is so easy – just a drill, bucket of insulators and a pair of scissors (great for us women)! We have quarter horses on a 15 acre block - riding horses as well as a few mares and foals. I think our fencing has been up for 5-6 years now and in that time there has been plenty of skid marks into the fences and stretched tape, but no injuries at all and all so quick to fix. We know the heartache of having to put down a horse due to a wire injury, which is why we sourced Stockguard fencing when we were setting up our property. We love it, our horses love it – very happy." K. Harding, SA (July 2018). "Just a few words about Woodshield and Stockguard fencing. 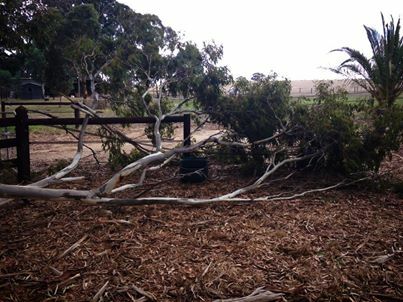 As a contractor I have come across many different types of horse fencing. I would consider Woodshield posts with StockGuard fencing to be one of the most safest and easy to use products. Both Woodshield and StockGuard are easy to maintain, looks great as a combination and is an extremely safe fence. 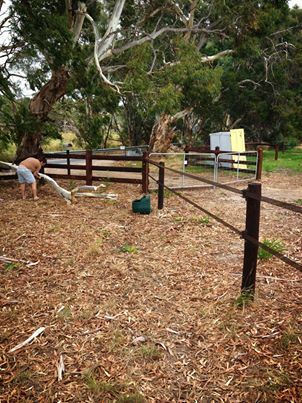 I would strongly recommend Woodshield and StockGuard to anyone considering new horse fencing." Pat Morrissey, Vic (July, 2018). "I have StockGuard and love it.... it is so easy to install, packs a good boot so the horses respect it, if they DO get into it (I have one that will get caught in seemingly any fence, social thing she is) it will just stretch a bit (the little wires haven't broken so conductivity not compromised) and is so easy to fix up and get back to looking good as new and it's awesome quality and lasts... have previously used the cheaper tapes and they deteriorate.... the StockGuard seems to age very well."